In your meeting request, click Join Skype Meeting. 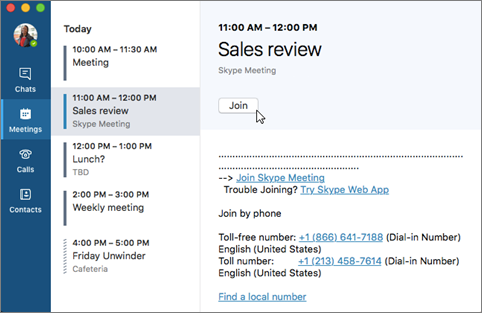 The Meetings view lets you quickly check your upcoming meetings for the day, without having to go to your calendar. You can even join a Skype Meeting right from the Meetings tab, if the meeting was set up by an organizer inside your company. In the Skype for Business main window, click the Meetings tab, and then right click a Skype meeting to join. Your mic is automatically muted. 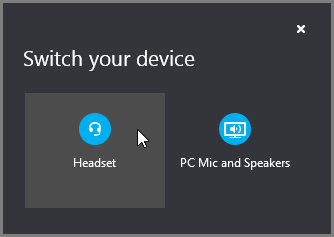 To unmute your mic, find the mic button, and click it. When it looks like this , people in the meeting can hear you. Note: Make sure you unmute your speakers too! If you need to switch to a different audio device, click the Call Controls button , then click Devices. The Switch Devices box shows your available audio devices, with the current one selected. Choose a different one if you'd like. Audio quality depends on the network and the device you use. Use a wired network connection and switch off wireless on your computer. If you have to use wireless connection, make sure you have a strong signal. Also use a high quality headset for better audio. 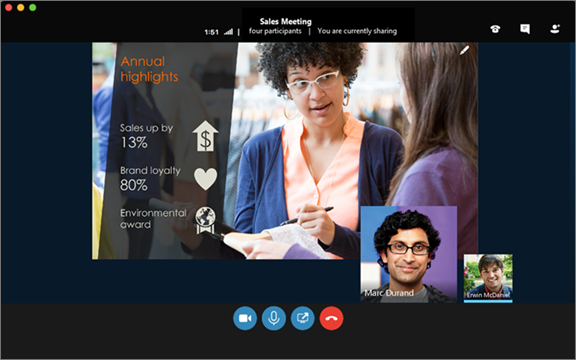 For more information, see Phones and Devices Qualified for Skype for Business. 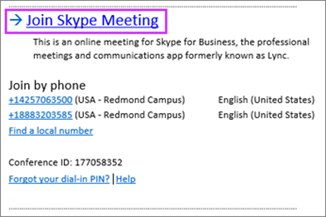 Skype for Business Web App is an alternative way to join the meeting if you don’t have Skype for Business installed. It opens automatically to connect you to the meeting. For more information, see What is Skype for Business Web App? If you’re on the road, or if you don’t have access to a computer, you can just call into the meeting with a phone. Make sure you grab the conference numbers and IDs from the meeting request before the meeting. See Call into a Skype for Business meeting on your mobile or desk phone. If you prefer to call in with a phone, instead of using computer audio, you can find the conference numbers and ID in the meeting request. You can also click Find a local number in the meeting request if you’re traveling. What about the PIN? You only need a PIN if you are calling into the meeting as the presenter from a public or cell phone, or if the meeting is set with high security. Otherwise you don’t need a PIN, just dial in and wait to get connected. If you need a PIN and don’t remember what it is, click Forgot your Dial-in PIN? in the meeting request, and follow the instructions on the page to reset. Skype for Business on Mac lets you quickly check your upcoming meetings for the day, without having to go to your Outlook calendar. You can join a Skype for Business meeting right from the main window, if the meeting was set up by an organizer inside your company. In the Skype for Business on Mac main window, find and double-click the meeting you want to attend, or click the Join button. To view meeting participants, to add others, and to mute participants if you're a presenter, click the button. 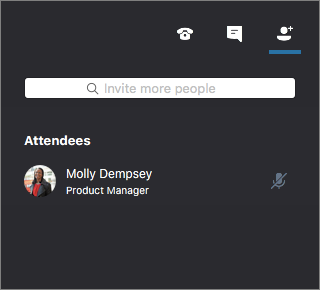 Use the Invite more people box to add more people to your meeting. To send an IM to meeting participants, click the button. Type a message, and then press Enter or click to send the message. When you first join a meeting, your microphone is automatically muted, and people in the meeting can't hear you. To unmute your microphone, click the button. When you first join a meeting, the video camera is inactive. To start your video camera, click the button. To exit the meeting, click the button. At the Need to leave? prompt, confirm you want to leave the meeting by clicking the Leave Meeting button.